Maps out the geographical areas of the 56 different indigenous peoples in the Philippines and their current population. 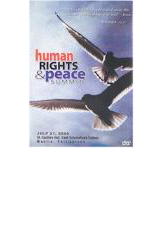 Human Rights and Peace Summit held at St. Scholastica’s College on July 21, 2006 was the church’s response to the spate of human rights violations in the Philippines and the spate of political killings. The summit was co-sponsored by the NCCP, the Ecumenical Bishops’ Forum and the Benedictines for Peace. This 24-minute video is an encapsulation of the summit and provides an overview of the human rights situation in the Philippines. Note: Prices do not include shipping and handling. Prices may be subject to change without prior notice..